"You got nothing to worry about. Besides, dynamite always blows down." 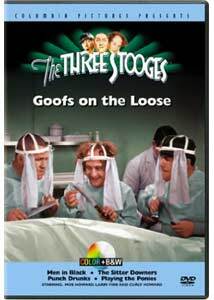 Columbia unveils its new "Chromachoice" colorization process with two DVD releases of Three Stooges shorts. These are potentially controversial for a number of reasons, not least of which is tampering with classic films (including the Stooges' only Oscar-nominated short). There's also a reduction of the number of shorts, continuing Columbia's disturbing trend, down to a mere four, without a corresponding reduction in price. Furthermore, this disc of four shorts duplicates two previously released on the first Stooges DVD volume, Curly Classics, making it a double-dip for Stooges completists wanting to obtain the other two shorts. That's irritating when a third of the 97 Curly shorts remain unreleased, as well as two-thirds of the 73 Shemp films (not to mention all four with Fake Shemp). While the colorization process is of dubious value, there are also some excellent side effects that make the disc somewhat less objectionable. First up is that Academy-honored short, Men in Black (1934), the third Stooges film for Columbia. Moe, Larry and Curly are the knuckleheaded graduates of the medical school at Los Arms Hospital, and they use a variety of oddball methods of getting around the hospital and periodically get into football huddles when they're not smashing the glass door of the superintendent. There's still some uneasiness with the format, including the introduction of an annoying doltish nurse (Jeanie Roberts), which leaves the Stooges acting as straight men on occasion. Eight face slaps and seven conks on the head get things off to a rousing start. Frequent Stooges foil Bud Jamison makes a brief appearance as a doctor. The second Stooges short for Columbia. Punch Drunk (also 1934), contains the classic sequences of Curly becoming a fighting dynamo whenever he hears "Pop Goes the Weasel." Naturally, Moe, acting as a fight promoter, gets Curly into the boxing ring, but when Larry busts his violin, Curly is in serious trouble. An extremely violent short, with Curly taking the lion's share of the punishment. One eye poke, eight face slaps and a delirious 46 blows to the bean, about half of the latter in the course of the climactic boxing match. Although they subsequently took some wrong turns, this short already finds the Stooges fully in the mode that would make them classics of comedy. Highly entertaining on all sides. The remaining shorts, both from 1937, are new to DVD. The Sitter Downers is one of a long string of construction site disasters for the Stooges. The boys want to marry Flora Belle, Cora Belle and Dora Belle (June Gittelson, Marcia Healy, Betty Mack, respectively), and when their father refuses to give his permission, they stage a sitdown strike. Becoming national heroes with fan mail, they are awarded a lot and a house. This gets dad to relent, but the problem with the house is it's do-it-yourself. Predictably, catastrophe results with some of the wildest house-building gags since Keaton's One Week. A surprisingly mild Stooges outing, with only one face slap and six blows to the noggin. Playing the Ponies opens with the boys operating a hash house. That's not going so well, so they trade the business for the race horse Thunderbolt. Unfortunately, Thunderbolt's a broken-down nag that can only be motivated to run with handfuls of chili pepperinos. Four face slaps and 16 thumps to the temple make it a reasonably violent outing, with Moe surprisingly taking about half of the damage for a change. Image Transfer Review: First off, the colorization still isn't really ready for prime time. If the creators are, as they state in the featurette, looking for a realistic color blend, they've missed the mark. The process frankly still looks like the old water-colored picture postcards (not entirely inappropriate, considering the period), but the use of computer graphics at least gets rid of the flanging and poor registration that plagued prior colorization efforts. I tried it out on two Stoogephile friends who don't necessarily share my contempt for the cultural vandalism that colorization represents, and they frankly preferred the B&W versions as well. But the close attention to each individual frame necessary for colorization isn't at all a bad thing. The four shorts here have been beautifully restored, apparently from 35mm source material. Fine detail is extraordinary, with individual hairs from Curly's five-o-clock shadow readily visible during Punch Drunks. Greyscale looks marvelous, to the point that these films look like they were shot in 2004. The two retread shorts look immeasurably better than the old smeary, contrasty, dirty and scratched source material used on the original disc, making this a very worthwhile improvement for the Stooge lover. I was prepared to condemn this release completely, but the level of care given to the shorts has caused me to relent. I still don't like the colorization, but the black & white looks magnificent. The only drawbacks are minor aliasing and the usual excessive edge enhancement found on Columbia releases, which are the only things keeping this from an A+ rating. Audio Transfer Review: The same attention hasn't been given to cleaning up the 2.0 mono audio, with all but The Sitter Downers still plagued with noise and hiss. That film is much less noisy for some reason, but they're all tolerable for 65+-year-old audio. Extras Review: Other than some self-promotional material that I don't consider an extra, the only bonus feature is an 8m:27s featurette on the colorizing process, showing the computer methods with discussions from some of the principals. It's mildly interesting for those curious about the process. Happily, a Play All feature is included for the shorts, and one can switch between B&W and color using the angle feature on the fly for making your own comparisons. Despite double-dipping on two shorts, the restoration is beautiful, making this a worthwhile upgrade. Even those not philosophically offended by colorization will probably not be overly-impressed by the color, but at least the B&W original is presented too.